Wash Cloth on head is the act of wearing a Wash Cloth on ones head while taking a Bath. It is used to cool the bathers head to counter balance the hot bath. 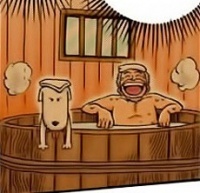 Hocker and Chouchou wearing them while bathing in a Barrel Bathtub. Kentaro Sakata has white one. It falls off when he is surprised and looks around to see men bathing with him. Haruka Urashima does it first. Then also Tamago Onsen and Lamba Lu both do it. "Ai Yori Aoshi episode 7"
Tina Foster wears a yellow one. Nami wears one while Arm Resting. Bald man wears white one. "Sekirei volume 5 page 54"
Karasuba wears one in chapter 41. Yoruichi Shihouin wears one while bathing with Matsuri Kudo. 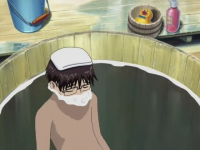 "Darker than Black Ryuusei no Gemini episode 1"
Sen Yarizui wears a Wash Cloth on her head while she is bathing in a Hot Spring with Ayame Shaga. Kodaka Hasegawa wears a white one. "Rinne no Lagrange episode 7"
Madoka Kyouno wears a yellow one while bathing with another girl. "Boku wa Tomodachi ga Sukunai NEXT episode 1"
Kodaka Hasegawa wears a white one in a Floral Bath of rose-petals however it falls off when he turns around rapidly. 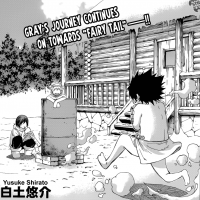 "Tale of Fairy Tail: Ice Trail/Chapter 4"
Lyon Vastia in an Oil Drum wearing one. "Yowamushi Pedal: Grande Road episode 16"
This page was last modified on 23 January 2016, at 15:38.